Encounters 2 is a “reduced” version of Encounters (2012), featuring an eight-channel sound and four-channel video installation originally mounted in the Audain Gallery at the Goldcorp Centre for the Arts in Vancouver between May 29th and June 11th 2012. The work features the pre-recorded vocal narratives and choreographed movements of nine Vancouver-based performers, material that was specifically designed for a gallery setting. Encounters 2 and Barca: el otro lado are just two of several works developed in Vancouver and Barcelona(1)These others are Haikai (2012), Here be Dragons (2012), Implicados (2012), Voces del Vacio (2012) and Here be dragons/Non Plus Ultra (2013). Extracts from all of these can be seen in different stages of their development on the project website and blog at www.sfu.ca and http://projectbarca.blogspot.ca that utilize the personal stories of performers who were given the task of linking their ancestral histories to the events leading up to and following August 3rd 1492 – the day Christopher Columbus left Spain for the Americas. It is therefore strongly recommended that the reader access some of this material documented at www.sfu.ca and projectbarca.blogspot.ca prior to reading this paper, the function of which is to contextualize and reflect on the impact of the research done within the frame of reference established by CARPA 3. The reader will without fail get a better sense of 1) how Project Barca’s research is related to the discipline of performance studies, 2) how we conduct that research from inside our performance practices, and 3) what impact the research has within as well as outside the Performance Studies and Practice-as-Research communities. The official title of our research project is “Barca: New Architectures of Memory and Identity”. We call it simply Project Barca. The overarching conceptual framework is defined by the phrase “going west to find east” and our main aim is to position contemporary choreographic practice at the center of a scholarly investigation that is framed by the question: how can embodied personal and collective memories be shaped into new architectures of identity and belonging in the form of innovative performance works that speak to wider sections of society? Project Barca is shaped by an apparent paradox in the phrase “going west to find east”, which is itself a take on Christopher Columbus’ 1492 voyage across the Atlantic to find a new trading route to the Orient. The trajectory of this leg of our journey links Barcelona, Spain, with Vancouver, Canada; an “Old World” city at the edge of the Mediterranean, and a fast growing metropolis that sits on the edge of the Pacific at the limits of the so-called “New World”. Our first step in mobilizing the research objectives began with inverting “going west to find east” to “going east to find west” and then using both phrases to play on the idea of going in either direction to find the other. The intention was to look at the implications of Columbus’ journey across the Atlantic for the people he encountered there, as well as for those who subsequently made this crossing, either by choice or through force. The next step involved deliberately conflating Columbus’ voyage with another journey that was concerned with the historical instability of the arts within the academy in particular and in society in general, and the enormous attempts made by both artists and academics to change this. For us, Performance Studies and PaR – or Research/Creation, Arts Research, and Art-based Research as it is variously called – are vehicles through which our own trans-Atlantic journeys of re-discovery are being conducted. I should also point out that my personal reasons for undertaking such a task has much to do with a desire to clarify for myself the scope of the contribution that the artist as academic can make here. Hence, the three questions posed in the second paragraph of this introduction preempt a set of ontological, epistemological, and methodological issues that are central to the concerns of this research and to the field as a whole. They take on a special emphasis here because we are essentially investigating the role that history plays in the formation of identity, while trying to frame the events and the peoples concerned within the context of artistic disciplines that have their own individual arisings and trajectories of development. Our argument is that the link between the two needs to be investigated from a new perspective. In Project Barca we do this in a unique way; we dynamically deconstruct their architectures and then we reframe them through a range of performance acts. We also review these processes through the lens of Performance Studies, the argument being that we have a better opportunity to “know” these inherited personalities and their complex architectures by manipulating them in a special way. Only then can we construct a better vision for the future. This, then, is the intention behind the title of our research “Barca: New Architectures of Memory and Identity”. Our journey begins with a definition that responds to the question of how our research is related to the discipline of Performance Studies, performance being defined here as acts of embodiment and disembodiment that we engage in for the excavation, recovery and analysis of personal and collective memories. We try to accomplish this with the help of new technology. In this context the term technological indicates a mode of operation that allows people to synthesize processes into discrete techniques, which are then used in the design of new tools that eventually become institutionalized as part of society’s collective memory. The flexibility and utility of Performance Studies, a discipline that arose out of and continues to draw on areas of study as diverse as sociology, anthropology, psychology, cognitive science, media studies, law, biology, neuroscience, history, computing science, and history of science, suits our objectives of designing a vehicle that can investigate and rearticulate a number of precepts, concepts, percepts, affects, and functions (Deleuze and Guattari 1994.) that seek to address the complexity of our human actions. Our discourse is transdisciplinary by nature; it engages movement as a function of bodies, presents concepts through a choreographic articulation of movement structures built up around the performers’ identities; body type, gender, race, nationality, and cultural backgrounds, and challenges notions of scientific logic by utilizing seemingly digressive, passing, and unmethodical strategies in an attempt to reverse-engineer, destabilize, and eventually re-present ideas that are crucial to our existence. We believe that the exploration, presentation, and articulation of performance using a defined PaR framework give us sufficient flexibility for such a task. To the issue of how we conduct artistic research from inside our practices we propose a hypothesis that should also be taken as the basis of an argument. We are unaware of many of the complex operations that take place within the human organism and in the world around us and therefore unable to fully comprehend the relationship between our internal selves and an external world replete with information. We therefore cannot claim this information as knowledge that is truly ours. In short, we are personalities masquerading as cohesive subjects that are not conscious of the inter-connectedness between the “I”, “you”, “we”, “it”, and “they” that frames our discourse with the world at large. (Gurdjieff 1950, Ouspensky 1983.) The methodological approaches and creative strategies we utilize in our work are designed to expose the machinery that constitutes these identities and to utilize them for a deeper examination of the behavior that constitutes our everyday lives. One of the strategies we use in the studio requires performers to learn the roles of other performers at different stages of the creative process. This technique is quite common within groups that are, for a host of reasons, susceptible to variables such as injury, sickness, or financial instability, for example. The difference in the devised work that we do is that the performers access deeply emotional states in “relating” the stories, experiences, and memories they bring to the process. For one performer to “learn” a role after having witnessed its dynamic emergence in another is quite an intimidating task. Nevertheless, it is a unique means for the learner to explore that “other” from the “inside” after having witnessed its emergence from the “outside”. Since the entire group is usually present during these processes and no one leaves the stage space during the performance of the work in front of an audience, a unique sense of community develops that is experienced as a presence by everyone in the room. These acts of “remembering” through “witnessing” different states brings a host of “virtual personalities” into a common space and allows all of them to be experienced. Everyone in the room is able to grasp and lay claim to the knowledge that presents itself as informational changes to their entire sensory apparatus. The result is a unique perception of the world around us. With respect to the question of what kind of impact we expect to create with our research, let me say that for a start we hope to influence the field by suggesting new inter-, multi-, and transdisciplinary frameworks for research. Secondly, we hope to instigate a shift in funding policies that currently limit how arts-based research is conducted. Thirdly, we wish to engage communities outside the limits of academia, and finally, we are suggesting changes to academic curricula that better enable us to do all of the above. Returning to the key research question stated in my introduction and regarding which I hope to take the reader on an interesting journey of exploration, I would now like to mention an event that took place more than a decade and a half ago that is important for the history of Performance Studies as well as my own journey as an artist and academic. In 1998 PSi#5 convened in Aberystwyth, Wales, under the provocative title “Here be Dragons”. The organizers invited academics, artists, performers, and all possible variations of these types to “map the unexplored boundaries and hinterlands” of Performance Studies. PSi#5 occurred at a time when PaR was officially being incorporated into the Higher Education system in the UK. I was writing my own PhD at the Department of Drama: Theatre, Film and Television at Bristol University while holding a post as Lecturer in Theatre and Performance at what is now Winchester University but which was then King Alfred’s College. A colleague and I performed Shango meets Ogun at PSi#5, a work that opened up new avenues in my own trans-Atlantic searches. On January 10th 2013 I presented a comprehensive new choreographic work in Vancouver titled Here be dragons – Non plus ultra. This work combined two prior productions; Here be dragons that premiered on June 3rd 2012 at the Goldcorp Centre for the Arts at SFU in Vancouver with a local cast of Persian Canadian, Chinese Canadian, Portuguese Canadian, First Nation Metis, and European Canadians, and Barca: el otro lado, that premiered on November 6th 2012 at Nau Ivanov in Barcelona with a local cast of Catalan, Castilian, Basque, French and Latin American Spanish speaking performers. These two works were made independently of each other. The performers never physically met until ten days before the combined event’s premiere. There was no conscious attempt on my part to connect the proceedings of PSi#5 or Shango meets Ogun with Project Barca or Here be dragons – Non plus ultra. However, in retrospect, the agendas of these separate research events can be seen as fulfilling a set of objectives stated long ago that continues to resonate far beyond the scope of this essay. Project Barca was designed as a vehicle, a barca, to explore my creative and academic interests. Part of its objective is to probe the boundaries of the academic and professional worlds of dance, theatre, music, live art, new media, film, and performance using the extensive toolkit of the artist/scholar. While PSi#5 was designed to “map the unexplored boundaries and hinterlands” of performance studies, much of the work we are concerned with in Project Barca has to do with revisiting the relationship between what some call “the market” and “the academy”. Notwithstanding the enormous co-extensive relationship that has always existed between these two, we believe that there is still new territory to be explored. However, care must be taken in how this is done since, as the aftermath of Columbus’ initial journey continues to demonstrate, the colonization of space, place, and identity is not limited to any particular era or academic discipline, the phenomenon exists everywhere. The apparent paradox that shapes much of Project Barca’s research and which enables us to embark on our journey “going west to find east / going east to find west” has much to do with my own identity as a Caribbean-born artist and academic trained for the most part in North American and European institutions of higher education and working primarily within the “triangular” post-colonized educational trade routes that connect Europe, North America, and the Caribbean. I am a product of many journeys that brought my ancestors to the West, some voluntarily but most involuntarily. Being born in this so-called New World makes me the inheritor of journeys these latter didn’t ask for and never wanted to be a part of, but were somehow destined to experience. One of these journeys Columbus never completed, others, the British, French, Spanish and Portuguese drew us into. (Williams 1944.) Still others I myself can’t quite comprehend. So, in pursuit of what I call “voyages of the reluctant”, I am building a boat, a barca, that utilizes a conceptual framework built with the timbers of Performance Studies, guided by practices of embodiment and disembodiment, and destined to travel west to find east and east to find west. Henry Daniel is a Professor of Dance and Performance Studies at Simon Fraser University’s School for the Contemporary Arts and Principal Investigator for Project Barca: New Architectures of Memory and Identity, a three year research initiative (2011–2014) funded by the Social Sciences and Humanities Research Council of Canada (SSHRC). He is a Juilliard trained dancer and choreographer born and raised in Trinidad and has performed with and choreographed works for dance and theatre companies including the Jose Limon Dance Company, The Alvin Ailey American Dance Centre Workshop, Tanz Projekt München, Freiburger Tanztheater, Tanztheater Münster, and Henry Daniel and Dancers. In this section of our joint presentation I will speak mainly about the impact of those aspects of Project Barca’s research that were developed in Barcelona, and specifically its impact in the areas I have been personally involved in. These include the preparation, creation, and exhibition of the dance-theatre piece Barca: el otro lado. Since the impact of this research is quite broad, I choose to concentrate on three specific areas: the first regards the intricate variety of goals and methodological approaches to achieve them, which I call a “transversal” impact; the second regards the wide range of people involved in terms of educational backgrounds and community links, which I would label a “horizontal” impact; and finally what I would identify as the “long term” impact of the research. Project Barca follows a transversal research trajectory, meaning that the objectives set for its achievement are markedly broad and ambiguous, a priori. But also with regard to the methodological approach and the desired impact, it involves links between a variety of disciplines, sectors of society, institutions and countries. Daniel has already outlined how his transdisciplinary methodology and his creative strategies are designed to problematize constructions such as identity and memory as well as our perception of them. He has also spoken at length about the overall objectives of the project so I will not elaborate further. What I do want to stress, however, is the notion of “linking”, which, in my opinion, is key to any analysis of the overall impact of the research. Project Barca, and its outcome Barca: el otro lado, are networking, collaborative initiatives. Even prior to the work in Barcelona, the project was concerned with generating links for medium and long-term collaborations. The first link is geographic; generating connections between cities and countries. A key objective working in Barcelona was to assemble artists from diverse geographic and disciplinary backgrounds living in the city. The project was promoted by a professor/choreographer based in Vancouver, Canada, who had the clear intention of bringing that Mediterranean work to a North American capital at the edge of the Pacific, with the involvement of collaborating institutions in both cities and respective countries. The second is the forging of long-term international links between different universities and academic institutions. Beyond our present project, we are currently strengthening ties to enable, for example, future exchanges of students, teachers and researches between UAB and IT in Barcelona and SFU in Canada. The link between academia and the professional art world. Since one of its goals is to engage communities outside academia, Daniel’s approach involved bringing academics and advanced students of dance, film, music, etc., in contact with professional practitioners of dance, theatre, and music who operate far away from the influence of universities. This occurred remarkably in Barcelona, especially because Daniel did not have the human and technical support at the institutional level that he is accustomed to in Vancouver. 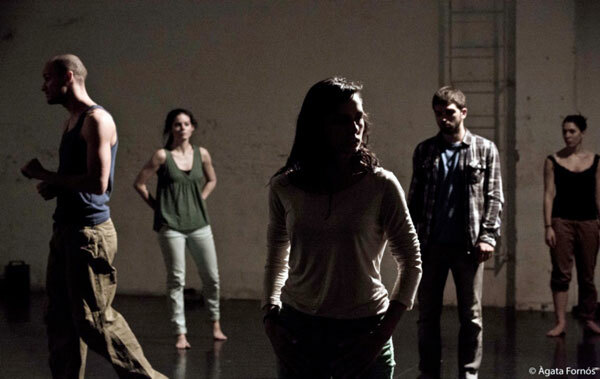 Almost the entire cast of artists and technical crew involved in the creative process of Barca: el otro lado in Barcelona are professionals who came on board because of their interest in the subject and in the choreographer’s approach to creation. The link between disciplines. In the performing arts it may be obvious, even tautological, to talk about interdisciplinarity. But I include it here as a specific point in the context of Project Barca’s research. There is not only a great deal of interdisciplinary development in the theatrical-choreographic creation itself, i.e., the collaboration of actors in the dramaturgy, the contribution of live musicians, the conceptualisation of symbolic and narrative images by media artists who created video-projected images to complete the overall dramaturgy, and the choreography around which everything simultaneously emerged, but Project Barca also explores the notion of multidisciplinarity in the presentation of its results. There are other artistic outcomes conceived and implemented by colleagues according to the needs and aims of each creator and his/her discipline, and in dialogue with Daniel’s vision. These artistic products are different in nature and have different authorships, but they are all inspired and motivated by the theme of Columbus’ 1492 voyage and the implications of that trip. Thus, the video-dance, film documentaries about the process, original musical compositions, gallery installations, academic papers, other performances including re-creations based on the theme that are being planned for the year of scholarship that is yet to come; all of these are independent and complementary parts of the investigation, attempts at materializing the issue of new architectures of memory and identity. In addition to the fact that there are several artistic disciplines involved, there are also doors to other fields of knowledge being opened. The idea of historiography as both an academic and an artistic practice, for example, is also explored; academically since during the creation of the piece each one of the artists involved had to do individual research on the relationship between their personal ancestry and the history of the fifteenth century Iberian Peninsula, and artistically since it was necessary for the contemporary dancers to experience some of the early dances around the period working with a specialist in the field. 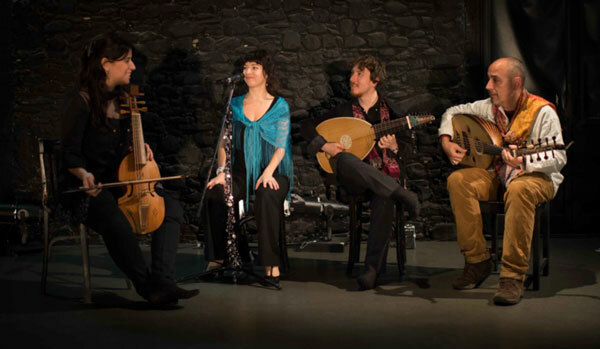 We also had musicians specializing in Medieval and Eastern music who found ways to transfer the uneasy coexistence of three different religious cultures of the Iberian Peninsula at that period into a unique contemporary musical work. And because each dancer had to research their own ancestral roots in order to provide a living historical link with 1492 and a live example of its consequences, they were able to own the work in a very special way. Ángel Zotes Ramos, de Laguna de Negrillos, León. Zotes, apellido tomado de un pueblo cercano por los judíos conversos. Ramos, apellido tomado de la naturaleza por los musulmanes conversos. Convertir, reconvertir, requeteconvertir y más reconversión. Siembra de desconfianza entre vecinos y amigos. Mentiras impresas para la identidad y el orgullo. Lo único que crecen son muros. Y las pilas bautismales no descansan. Ángel Zotes Ramos, from Laguna de Negrillos, León. Zotes, name of a town taken as a surname by converted Jews. Ramos, term of nature taken as a surname by converted Muslims. Conversion. Reconversion. Re-reconversion… and more conversion. Mistrust seeds among friends and neighbors. Lies printed on identity and pride. The only things that grow are walls. And the baptism polls are always busy. More than 150 audience members who enjoyed the presentations. 32 dancers who took workshops in Barcelona during July/August 2012. Another 18 students who took classes with Daniel during his second stay in Barcelona during October 2012. 17 dancers involved in the October 2012 castings. A collaborating center that was our host, the professional dance school AREA and its correlation of students. Other collaborating institutions are the Theatre Institute of Barcelona, IT Vic and Nau Ivanow. Organizations interested in our future work: UAB, Instituto Cervantes, Institut Ramon Llull, and Festival BAD, NunArt, La Villaroel, Grec Festival, Mercat de les Flors, and a number of contemporary dance exhibition centers we are currently in dialogue with regarding current and future work. The entire cast and crew of Barca: el otro lado. The artistic team is composed of 8 dancers, 4 musicians, one actress, three multimedia artists, two filmmakers and one lighting designer, all of whom have been actively involved in the creation of this work. All of the above-mentioned participants received information, raised questions, made creative explorations and generated their own conclusions concerning the issues raised by the research, namely; historical memory, personal and cultural identity, encounters with the other and with the unknown as an opportunity for self-knowledge, and the notion of historicity seemingly determined at random, i.e., the miscalculations of Columbus, the political and religious preferences of Queen Isabel the Catholic, and the personal decision of each Muslim or Jew compelled to convert or emigrate. Many of these issues are directly and indirectly addressed in the work, through spoken text, movement actions, and song. An interesting question emerged during our research on the music that raised the issue of authenticity within the context of history. How can we act, for example, when contemporary experimental music encounters Sephardic or Andalusí music? (“Andalusí” not translated as “Andalusian”, but referring to the Arabic dialect spoken and the Arabic music created during the medieval period in Al-Andalus). I experienced this dilemma when I was unexpectedly thrust into the role of singer while working on Project Barca. In the process of learning an anonymous Sephardic song (collected by researcher Manel Forcano and musician Jordi Savall), I felt the challenge of trying to capture the medieval and oriental character of a song that was presented to me in a lyrical mode. The song is essentially a lamentation in Sephardic that speaks of the sorrow of having to leave one´s land following Ferdinand and Isabella’s edict. My challenge, in terms of vocal technique, was to sing it in what I felt would be a more grounded rendition. But how does one sing an Andalusian Jarcha from the 13th century, the lyrics of which are not totally transcribed or even translated? I proceeded to do my own research, first speaking to Moroccan friends settled in Barcelona and later to others in the Basque Country. I also wanted to get a better sense of what the correct singing pronunciation would be for a dialect that is no longer spoken. I can say that the results were quite different to what I had expected and to that recorded by Jordi Savall and the Hespérion XXI ensemble. Finally, although each individual involved in the project has their own particular perspective on the impact of the research, they are not here to present. As one of their representatives, I feel privileged to share my personal perspective in the following paragraphs. Some time ago a Basque woman, born, bred, and schooled in Vitoria-Gasteiz with undergraduate and graduate degrees in Art History, chose to experience life for a short time in Paris and New York. Following this she moved to Barcelona with the intention of developing her acting and singing career. In pursuit of a broader approach to theatre studies and seeking to combine her practice and research in art, she enrolled in the postgraduate program in Performance Studies at the Institut del Teatre. Unable to financially sustain her two separate vocations there, and after a second graduate degree, she decided to leave academia. In August 2012 she encounters a polyhedral Professor who introduces her to the notion of PaR and two weeks later she embarks on a new journey as his Research Assistant. Within 6 months she finds herself in Helsinki delivering a joint paper with him on the impact of Practice-as-Research. This chance meeting results in a collaborative opportunity that clearly demonstrates the inherent potential of the project and the force of its impact. Firstly, Project Barca is conceived, understood, and developed in a manner that gives me the opportunity to experience new approaches to conducting academic research. I also had numerous opportunities to be involved as a researcher/performer at many different levels; as assistant to the director in dramaturgy, singer, actress, voice and Spanish diction coach, translator, and production coordinator. I was able to use many skills acquired in my professional training within the context of a single creative project, and in so doing concentrated on integrating these across borders rather than in a set of divergent practices, which was usually the case in the past. Secondly, Project Barca has motivated me to develop a Practice-as-Research approach in my current thesis. However, since Spanish higher education legislation does not recognize PaR as a valid research mode per se for a doctoral thesis, I have a dilemma. To resolve it I need to generate a unique approach that best serves the direction of this thesis, which means stretching the limits of the existing structures of my institution and perhaps helping others who may share my predicament. To conclude my observations on the long-term impact of Project Barca, Daniel’s project has inspired, motivated and financially supported the beginning of my own doctoral work in Performance Studies with PaR as a viable option. I believe this in itself contributes to the recognition and future development of PaR, especially within the rich environment that UAB and IT can potentially offer. Rakel Ezpeleta is a PhD candidate in Theatre and Performance Studies at Universitat Autònoma deBarcelona and Institut del Teatre. Born and raised in the Basque Country, she is a singer and actress with specialist training in Meisner technique and a Masters Degree in Art History. Ms. Ezpeleta coordinates the entire research for Project Barca in Spain and also performs in Barca-El otro lado and Here be dragons – Non plus ultra. Borgdorff, Henk 2007: “The Mode of Knowledge Production in Artistic Research”. In Gehm, Sabine, Huseman Pirko, von Wieke Katharine (eds.). Knowledge in motion: perspectives of artistic and scientific research in dance. Bielefeld: Transcript Verlag. Féral, Josette 2005: “Recerca i creació”. In Estudis Escènis (Quaderns de l’Institut del Teatre), 35. Barcelona. Hannula, Mika, Suoranta Juha & Vadén, Tere 2005. Artistic Research -theories, methods and practices. Helsinki: Academy of Fine Arts, & Gothenburg: University of Gothenburg, Art Monitor. Sánchez, José Antonio 2005. “Investigació i experiencia: Metodologies de la investigació creativa en les arts escèniques”. In Estudis Escènis (Quaderns de l’Institut del Teatre), 35. Barcelona. Savall, Jordi, Forcano Manel & Hespèrion XXI 2007. Christophorus Culumbus: Lost paradises. (Hybrid SACD-DSD). Bellaterra: AliaVox. Various Authors 2010: Práctica e investigación / Practice & Research. Cairon 13: Revista de estudios de danza / Journal of Dance Studies 13. (eds. Victoria Pérez Royo and José Antonio Sánchez) Alcalà de Henares: CENAH (Centro de las artes de la universidad de Alcalá). Various authors 2011: Artistic Research in Action. Proceedings of CARPA 2 – Colloquium on Artistic Research in Performing Arts (ed. Annette Arlander) The Publication Series of the Theatre Academy vol. 42, Theatre Academy Helsinki.